Armpit to pit 19.5” top to bottom 28.5”. is available. Shirt is in like-NEW, perfect/pristine condition and has likely never been worn. I usually take a lot of them so you can see exactly what you’re buying. Great shirt in great condition. "Ravens" is stitched. Men's 2XL. Shirt is brand new, any questions please ask. Signage Screen Printed and in good condition. Condition=Good Pre-Owned Condition ! Overall This Piece Looks Great and you will love it at a fraction of the price! Selling this great shirt from Forty Seven Brand for Super Bowl XLVII which featured the Ravens and 49ers. Size Medium, solid gray color, 100% cotton. The shirt has some light fading consistent with normal wear and wash. The shirt is in good, clean, pre-owned condition and is ready for a new home. Please see the pictures to judge the condition for yourself. Measurements are provided in the pictures. Please check out my other listings to combine shipping and save money. Questions are welcomed. MADE BY TEAM NFL. MODERN FIT. 100% COTTON. SHORT SLEEVE. Shirt is athletic cut, short sleeved tee. Shirt is black in color. The following conditions apply. NWT Baltimore Ravens Gray NFL Team Apparel T-Shirt Medium Brand New With Tags!!! Baltimore Ravens Gray NFL Team Apparel T-Shirt. Full zip with 2 pockets in front. Team: Baltimore Ravens Brand: Majestic Size: 2X Gender: Men Product: Big & Tall, Long Sleeve T-Shirt with Sewn on Logo, Patch and Stripes on the Sleeves ​Material: 60% Cotton 40% Polyester Condition: New without Tags. Long Sleeve Easy Care Shirt 5x and 6x. Place hand on hip. Embroidered above the pocket. Wrinkle resistance makes this shirt a cut above the competition so you and your staff can be, too. Arm 40 1/2. 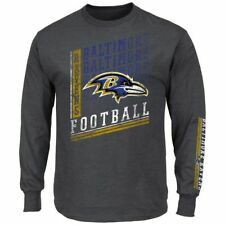 new Baltimore Ravens shirt size small, color gray. VF Imageware 50% cotton 50% polyester. Shirt is athletic cut, short sleeved tee. 100% cotton. Shirt is black in color. The following conditions apply. NFL Baltimore Ravens Football Short Sleeve GrayT Shirt Mens sz XL ? Shoulder to Shoulder: 18 ". Armpit to Armpit: 25 ". Length (top to bottom): 30 ".